Hard water costs you more than you may imagine. 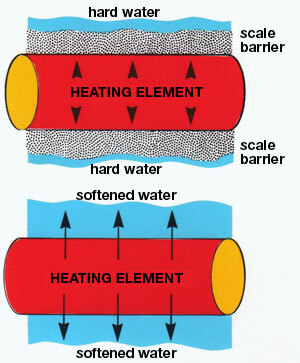 Any amount of scale in your heating system can seriously reduce the overall efficiency, as demonstrated in the diagram and figures above, and backed up by published research papers. Independent studies have also been undertaken to quantify greenhouse gas reduction through the use of a water softener. One such article concludes that water softeners and RO units together will reduce greenhouse gases equivalent to getting one and a third cars off the road for an entire year! A water softener will remove all scale from your heating system and prevent any future recurrence, allowing your system to function as it was designed to do.